Machete is a convenient utility for playing andediting multimedia files. 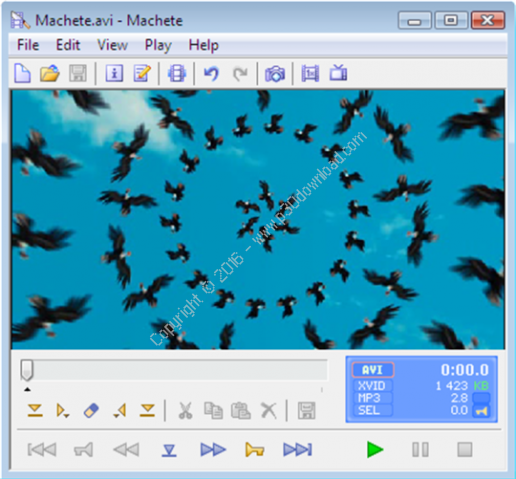 Currently, Machete can edit video andaudio files in AVI, ASF, WMV, WMA, MP3 and FLV (Flash Video)formats. The support of editing functions for other formats isplanned for future versions of the program. With Machete, you canplay some other multimedia files as well (in addition to thoselisted above). None of the editing operations in Machete requiresre-encoding of video or audio streams. This is why the editingprocess is very quick and does not lead to any loss of videoquality. This puts Machete in the category of lossless video editors.Also, it means that you do not need a powerful and expensivecomputer to edit your video material. After a file is edited andsaved, it retains its original format. With its extremelyuser-friendly design, Machete is an ideal solution for quick andeasy “slicing” of your multimedia files. You can delete unnecessaryfragments (e.g. cut out commercials), copy, move, mix and saveindividual pieces. This means that Machete combines thefunctionality of both video splitter (cutter, trimmer), videojoiner (for joining multimedia files with exactly the same formats)and more.